"I'm very concerned that (then-candidate Barack Obama) may have anti-American views. That's what the American people are concerned about. That's why they want to know what his answers are... I think the people that Barack Obama has been associating with are anti-American, by and large, the people who are radical leftists. That's the real question about Barack Obama... I wish the American media would take a great look at the views of the people in Congress and find out are they pro-America or anti-America. I think people would love to see an expose like that." Such statements hold the implication that anyone in ideological disagreement with Bachmann is anti-American. Subsequent to these inflammatory remarks, the Republican National Committee suspended $1M in advertising they had planned for Bachmann, and her Minnesota Democratic-Farmer Party challenger, Elwyn Tinklenberg, quickly received $750,000 in donations. Bachmann won re-election narrowly, although her district is overwhelmingly Republican. 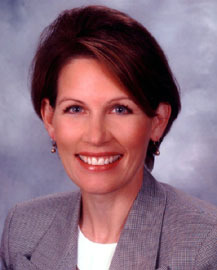 Marie Horrigan, Rachel Kapochunas and Jesse Stanchak, "House Rating Changes Topped by Bachmann Blow-Up", Congressional Quarterly Online, 21 October 2008.